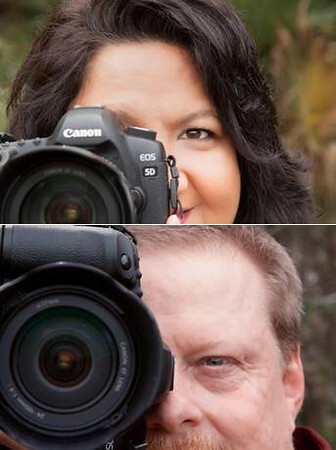 Mark and Miriam Peck are a husband and wife photography team who specialize in wedding photography and love their jobs! From their base in Central Florida, near Orlando, they can easily travel to just about any wedding destination you desire. They are proud members of the Professional Photographers of America (PPA) and featured on WeddingWire.com. They are easy and fun to work with and take care of all the details so you can truly relax and enjoy your special day. As location photographers who use a photojournalistic approach, they always fully scout your venue ahead of time. This allows them to familiarize themselves with the unique lighting and architectural aspects of the space and make any necessary arrangements to make sure your wedding photography goes as smoothly as possible. Mark and Miriam began their careers by photographing weddings, special events and celebrations for their family and friends. They have a very large, very extended and very close-knit family with lots of cousins, aunts and uncles, and two teenage children of their own. Their home is full of love, laughter, a bit of chaos, lots of friends and plenty of food! As their reputation grew, so did the demand for their services. Transitioning from documenting family events to offering a professional service was a natural fit for these two photographers. In 2008, they decided to turn their love of wedding photography into a full-time business. Their passion for their work comes through in the thoughtful and timeless engagement and wedding images they produce. The Pecks share a great sense of humor and have a deep respect and appreciation for one another's unique skills and abilities. This seamless collaboration of two very talented and fun photographers results in outstanding creativity, beautiful imagery and great memories that you will cherish long after your wedding day is over.